Fowl Behavior: Chicken advent[ure] 2 -- rolling coop plans? 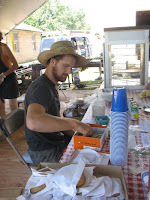 Son Ian, an organic farmer and surfer, emails from his winter home in the Bahamas, "I'm going to be building a rolling chicken coop when I get back to the farm [That's him working a concession during the Tomato Fest at Red Fire, Farm in Grandby, MA]. And I'll probably be helping to take care of them Patrick, the chicken guy, says his chickens are particular about their feed, and he drives to Sudbury to get it." That's 73 miles! My chickens will have to eat the same way my four children did: from what's put in front of them, or scrounge for something better! I started reading "Keeping Chickens" by Jeremy Hobson and Celia Lewis. Some of the breeds are astoundingly beautiful. There's a sub-culture of chicken enthusiasts. I'm not in their class. 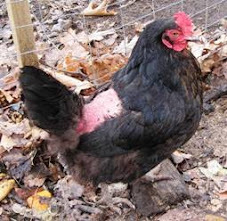 My goal is simple: to raise chickens to eat their eggs and have a modicum of self-reliance. MAYBE I'll learn to butcher them, especially if they taste good. Jeremy's book is giving me confidence I can do it. "Keeping chickens is an excellent hobby for children, teaching them responsibility through feeding and general care." If a child can do it, I can do it. I've been a 4-H leader. The only animals we focused on were dogs. DRAT. Another missed opportunity. I wonder if I'm too old to join a 4-H group? This weekend, I'm going to install the drying rack and talk to hubby about us building a chicken coop. Does anyone have any plans for a modest chicken coop on wheels? My plan is to wheel it around the lawn so they can feed, fertilize the lawn and peck the pests from the lawn.